Broadcast antenna or cell tower zoning is more complex than you might think. As the broadcasting industry developed, in the U.S. many primarily residential suburbs had height restrictions on all buildings that sometimes were as low as 35 feet for any building, at least outside of industrial zoning. So typically would-be tower owners had to seek a zoning change. Eventually in the U.S., the FCC (Federal Communications Commission) became concerned about the restrictiveness of local zoning, and began claiming a federal interest in the capability to erect communications towers of all types. They stated they would preempt local zoning to the extent necessary to uphold a federal need. In 1996 the Federal Communications Act strengthened the FCC's ability to preempt or override local zoning. It gave a complete preemption to the federal government with regard to regulating RF radiation exposure standards. From the local perspective, one of the frustrations is that the FCC refuses to be explicit about their ideas on what is considered acceptable. So antenna and tower zoning remain to be issues decided by the FCC and local authorities on a case-by-case basis. Different media have different technologies (cell phone versus digital television, for example). This is why we called this period an awkward adolescence when we first wrote this page. Since there are so many variables, and the federal government didn't want to write down all the specifics about when it would preempt local rights, it was somewhat difficult to advise local communities about how to protect the interest of their citizens in locating towers in a way that protected aesthetics. Now the picture has become even more complicated. In urban areas, almost all new cell phone and broadband infrastructure takes the form of small cell technology often mounted on existing utility poles. However, in smaller towns and in semi-rural areas, new tall free-standing towers still are being deployed at a rapid pace, so this page will apply to many communities. 1. You can't outright prohibit all antennas and towers. You must find some place for them to be. That's not legal advice, but I am just repeated what the FCC has said. 2. You can prohibit other land uses within a tower's "fall zone," which would be equal to a radius around the tower of some slightly higher number of feet than the height of the tower. Some tower owners now are arguing that their pole is designed so that it bends in half rather than the entire thing falling, so they want the fall zone to be considered a lesser radius. Also be aware that a tall tower requires "guy wires" to anchor it to the ground, so for that additional reason, tower zoning will require more land than you might think. 3. You should highly encourage the practice of "co-location," which means placing technology for more than one communications medium on the same tower. In the end, your town or city probably can't require co-location and win in court, but you can make applicants jump through so many hoops showing that they have tried to co-locate with other firms that they'll give up or co-locate in most instances. 4. Cell phone technology at least has been able to develop some styles that are rather aesthetically pleasing. They can be concealed on other poles or in trees in parks, and in church steeples. Or they might simply resemble trees. That's an interesting possibility, don't you think? 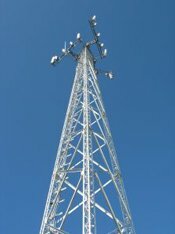 A number of rooftop designs also have been developed so that some cell phone towers are readily tucked into industrial or warehouse areas. 5. The 1996 Communications Act also prevented condo CC&Rs from restricting against small satellite dishes and all zoning regulations from prohibiting television antennas sufficient for reception. 6. In addition to the FCC, tower zoning or especially a series of towers might require an environmental impact statement under NEPA (National Environmental Protection Act), or a Certificate of No Hazard from the FAA (Federal Aviation Administration). 7. It's certainly within your rights as a municipality to require fencing and posting of appropriate warning signs. Those can be easily related to health and safety. Your aesthetic regulations, like all aesthetic regulations, would be harder to defend in court. 8. You have the right to require very detailed engineering plans and to require quite specific, yet understandable, explanations of the functioning and dangers of a specific instance of tower zoning. Don't be bullied by a communications lawyer; insist on a layperson-oriented explanation. This issue has quite a bit in common with wind turbine zoning, about which we have written a specific page. If you're coming to this subject with a need to learn more about cell phone tower location potential for a particular property, whether publicly owner or private, check out friends at the site just below. AirWave Sites, Your Rooftop Antenna and Cell Tower Leasing Partners.